The BRK Brands, Inc. model number 7010B is a wire-in, 120V AC 60Hz single and/ or multiple station photoelectric smoke alarm specifically designed for residential and institutional applications including sleeping rooms of hospitals, hotels, motels, dormitories and other multi-family dwellings as defined in standard NFPA 101. Model 7010B complies with UL217, CSFM, NFPA 72, HUD, FHA and other agencies that model their codes after the above agencies. 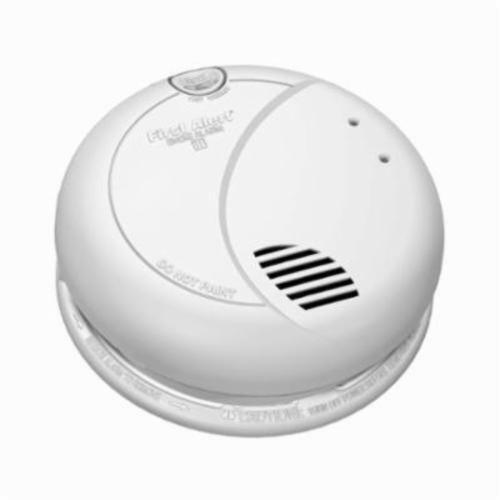 It meets building codes where AC/DC with silence photoelectric smoke alarms are required. The alarms are interconnectable with up to 18 devices, of which 12 can be smoke alarms. The BRK 7010B features a photoelectric smoke sensing chamber, an 85dB horn, a 9V battery back-up and a "silence" feature. Optipath 360 technology provides 360 degrees of direct access to the smoke sensing chamber. Alarm Latch: Easily identifies initiating alarm even after alarm condition has subsided. The "Perfect Mount" system features a gasketless base and a mounting bracket that keeps the alarm secure over a wide rotation range to allow for true alignment. This will allow fine tuning on the positioning to compensate for out of aligned wall studs and to keep the wording level when wall mounting. Battery installation and removal can occur while the unit is mounted to the ceiling or wall via the side load battery compartment. Other Contractor Preferred features include a dust cover to keep alarm clean during construction, keyhole slots in the mounting bracket eliminate the need to remove the electrical box screws for installation. Two locking features are provided to prevent battery theft and/or theft of the unit. Connection to AC power is made with a "Quick-Connect" wiring harness. Installation is quick, easy and cost effective.